I first became aware of Greek mythology in fifth grade. My teacher in an industrial, rough and yet rural school, believed in the benefits of teaching aspiring drug addicts and laborers the stories of gods and heroes. I immediately adored the stories we heard and read. Raised in a religious household, however, I feared enjoying the tales of what were admittedly pagan gods after all, too much. In the educational topography of my youth, we were on the brink of this brave new electronic world we’ve entered, and mythology was not considered a terribly useful part of the curriculum after that. I left the gods behind. In a class on the Christian Scriptures in college, however, my instructor suggested we all go see Clash of the Titans (the 1981 version) for its appreciative (if a little hokey) presentation of the Greek world. I enjoyed the movie and even took a class in the literature department on mythology. Over the years I have touched and gone on Greco-Roman mythology while specializing in the mythology of Ugarit. Now that I’m teaching a course on mythology, I’m going back to my classical roots and rereading the stories of times not quite so ancient as the fertile crescent civilizations’, but older than what is considered practical nowadays. 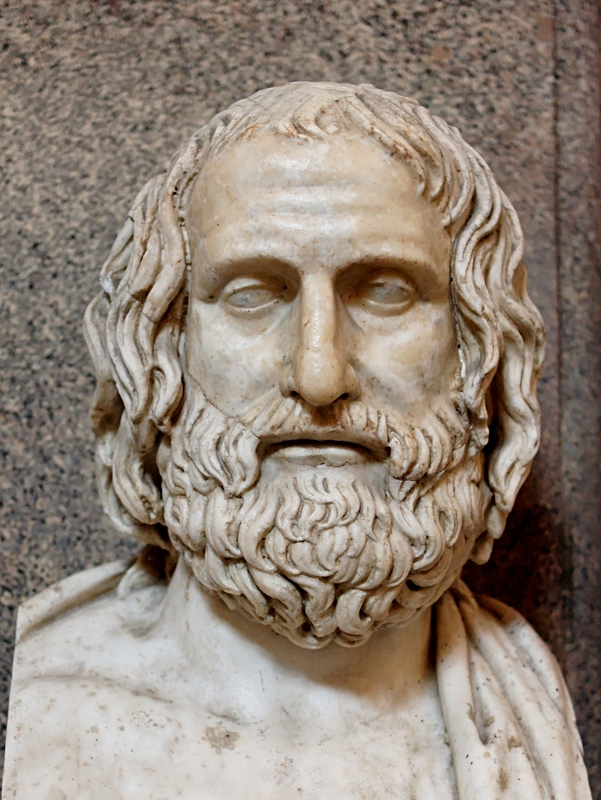 While rereading Euripides’ play The Bacchae, the concentration of images, concepts, and actions that recur in the Bible stood out in chiaroscuro. Especially noticeable were references to Paul in the book of Acts. Like Paul, Dionysus comes to be imprisoned. Not recognized as a divine figure, King Pentheus of Thebes locked him in chains until he could demonstrate that Dionysus is just the wild imaginary figure of repressed women. An earthquake, however, soon rattles the city and Dionysus emerges, chains shed, to the astonishment of Pentheus. The scene reads like Paul and Silas’ escape from jail in Philippi (Acts 16). Admittedly this could be coincidence. A few lines later, however, Dionysus, free from prison, tells Pentheus, “Don’t kick against the goad – a man against a god,” (Act 3, Paul Roche’s translation). Even so, Paul on his way to Damascus sees a vision of a god and is asked, “Why are you persecuting me? It is hard for you to kick against the goads” (Acts 26.14). Perhaps Luke had read his Euripides? Now I’m no scholar of the Christian Scriptures (although I have taught courses on them a time or two), but when obvious parallels exist it is incumbent upon modern readers to pay attention. The parallels of Dionysus and Jesus were evident to early Christians, so what I noticed was nothing new. When the followers of Dionysus, however, strike a rock with their sticks and water flows out, I wondered if Euripides had read his Torah! This entry was posted in Bible, Books, Classical Mythology, Deities, Just for Fun, Posts and tagged Acts, Christian Scriptures, Clash of the Titans, Dionysus, Euripides, Greek mythology, Paul, The Bacchae, Ugarit by Steve Wiggins. Bookmark the permalink. Those are really interesting parallels, great story. LOL at the photo caption. It is too bad that religious people can feel threatened by material like this. But I don’t know why I didn’t explore them in the past, because of exhortations not to, or a subliminal desire to avoid the increased cognitive dissonance I suspected it would create. Oh well! Any good book recommendations on the topic? I picked up Joseph Campbell at the library and found the depth it provided a bit daunting. I’ve been pondering your question for some days now. Treatments of mythology tend to be either complex or facile. Joseph Cambell is a good place to start. A couple of other sources I’ve found helpful that aren’t too technical are G. S. Kirk, Myth: Its Meaning and Functions in Ancient and Other Cultures and Elizabeth and Paul Barber, When They Severed Earth from Sky: How the Human Mind Shapes Myth. Try starting with Campbell’s Hero with 1000 Faces before moving onto his later works. Have fun discovering truth!